One of the best things about Blondie's new nabe is her proximity to Peter Pan Bakery. She's told you about the wonders of their chocolate doughnut, their muffins, their cinnamon buns, but let's talk Red Velvet doughnuts. 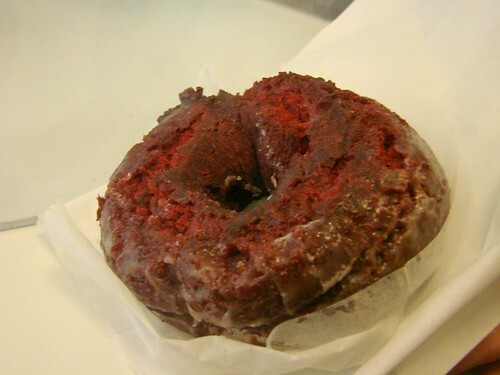 Before Peter Pan, I'd never even heard of Red Velvet Doughnuts. In fact on our first trip there Lawman and I were beguiled by a chocolate frosted, cream filled number that we were blissfully unaware of the growing crowd behind us as we sat at the counter. When we had finished up our doughnut we finally looked up and noticed that everyone else was doughnutless and waiting. Moments later the infamous Red Velvet doughnuts that Blondie had spoken so highly of emerged from the back. It was like locusts. LOCUSTS. And Lawman and I had wasted the last bit of our post brunch tummy space on that other doughnut. We vowed that next time we hit Greenpoint we would not be denied. It took a couple of tries, but after a recent brunch with Blondie we decided to pop in just to check and see if they had any Red Velvets. While we were waiting in line a baker burst through the kitchen door with a huge tray of hot, fresh red velvets. Score. We go the very first one off the tray. Still warm, this doughnut was melt in your mouth delicious. Not as chocolatey as a chocolate doughnut with a hint of extra sweetness from the glaze. Lawman mentioned craving this doughnut no less than 3 times this weekend. I guess we'll be making a Greenpoint pilgrimage soon. Oooh thanks for the tip! I will have to try that when I move back to Brooklyn! Next time you go, try the marble cruller. My idea of heaven. Seriously, sometimes I have to cross Manhattan Ave just to avoid their gravitational pull. Wow, I've never tried a red velvet doughnut before. Another reason that I want to visit New York. Yummy! Torture! My favorite doughnuts, possibly in the world, are Peter Pan! I've never tried this one though. Yum! I am obsessed with anything red velvet these days.....that looks amazing!! Junior's red velvet cake is pretty good as well..I may have to get a piece to hold me over!!! @debbie koenig I've been telling them about the crullers, especially the red velvet crullers! That's part of my hangover cure! Word on the crullers, but my personal favorite has gotta be the glazed sour cream! This is one of my favorite places (of any kind) in New York if not the world. The doughnuts, the breakfast sandwiches, the uniforms, the counter... pure classic. Wow... that doughnut is calling me to get up 95 to NYC ASAP!!! What a PERFECT application of red velvet! this sounds amazing! 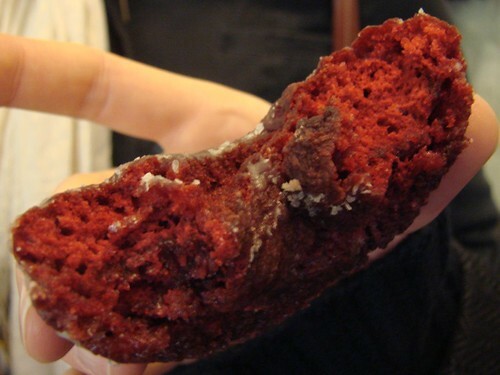 i recently had a red velvet muffin from a bagel store near my home in queens, and that blew my mind also! @Abbie: RED VELVET MUFFIN! RED VELVET MUFFIN! Was it better than a red velvet cupcake (sans frosting)?